Everyday 46 children are diagnosed with childhood cancer. That is two classrooms full of students; two classrooms of kids who want to learn and play with their friends. As the school year dawns, there are so many children who won't go to school--because they are in the midst of battling childhood cancer. There are also children who spent their summer in treatment and will return to school as cancer survivors. There are children who will never return, because they are gone. 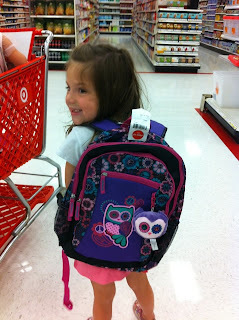 Thursday, I will be on my knees with joy and gratitude that Lily will start school. She will start first grade, on-time, in a regular class with a backpack she picked out and walk herself to class. It is a milestone and for Lily, who battled a brain tumor at 14 months old, it is a miracle. But, I can't stop myself from the anxiety and the preemptive concern that somehow a teacher will misunderstand Lily; that somehow she will be singled out as the cancer kid. A diagnosis of a "brain tumor," carries with it so many preconcieved notions. And even after four years in the same school (for pre-k, kinder and now first grade), I hear the questions of new teachers and team members rolling in my head: "is she learning disabled? will she be safe in the playground? should I just carry her from class to class? what are those bumps on her head? am I allowed to talk about cancer to her?" Every cancer survivor is different; however the parental concerns are universal. Here's what I and other cancer parents want teachers to know this school year about childhood cancer. 1. Cancer is not a bad word. It is what it is. If my child is comfortable with speaking about it, please let them. If they are not, then that is okay too. 2. I am not telling you about my child's diagnosis because I want sympathy or special attention. I am telling you because you need to know: it is part of who my child is and it is part of our family. 3. Cancer and treatments take so much out of their bodies--and even though it all, all a child wants is to be like every other child. 4. Sometimes when you look at my child, you can't see the turmoil that going on inside their bodies. Children are resilient, but they are not indestructible. 5. Cancer treatment can lead to hidden disabilities. Our children may fatigue easily, may have more difficulty handing stress than other children, may feel different than or isolated from their and may not want to be singled out as the child with cancer. 6. Not only are the children with diagnosis struggling, but siblings suffer too. It is easy to forget the healthy siblings and all they are dealing with. 7. That sometimes, a doctors appointment or an out patient therapy appointment, might be more important than school. We, as parents, are dealing with life and death, math can wait. 8. That not every child with cancer is the same: treatments vary, side effects vary and outcomes vary. A diagnosis of a brain tumor means nothing more than: brain tumor. Please do not assume because they are out of treatment that they are back to normal And also do not because they had treatment that they are damaged. 9. And while our family lives and breaths cancer everyday: our child also lives and breaths childhood. We tell you all we know, so you know and you can be part of our child's team. But cancer does mean they are no longer children. 10. The bottomline: our children are children in spite of brain tumors and radiation and chemotherapy. They are real kids. A special thank you to my good, dear friends in EpendyParents. I would be lost without their friendship and wisdom. Go Gold and share this blog. i love that. they are kids who want to play.